Of all the places he could be on a sunny Friday afternoon in September, Chris Covington chose a cemetery. It might seem an odd choice, but if you saw the state of Geer Cemetery at 800 Colonial St. in Durham, you might understand why. After looking at the rusty, dilapidated fences, the overturned tombstones and the rotting logs, it’s clear that something has to be done — and it would seem that volunteers like Covington are the ones to do it. 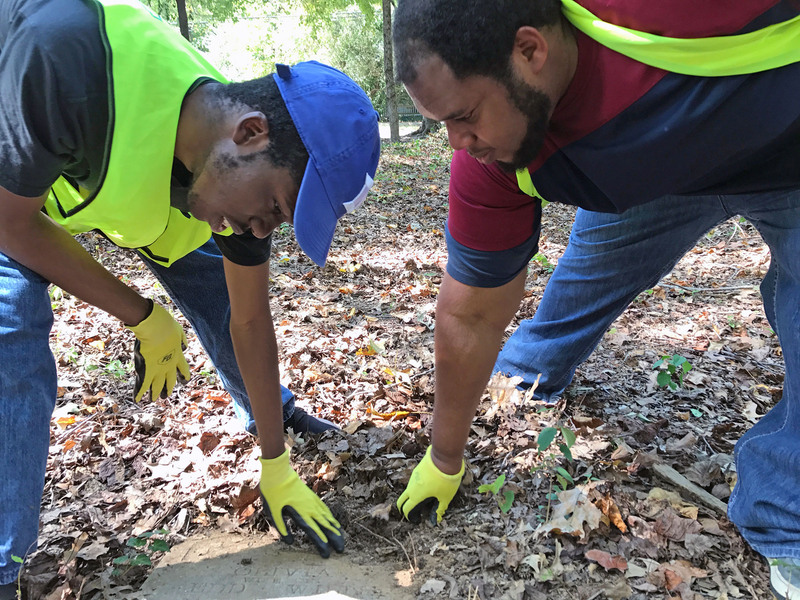 Covington, 20, was one of the many volunteers from Keep Durham Beautiful and Durham Technical Community College who spent their afternoons working to clean up Geer Cemetery on Friday, Sep. 29. All donning bright yellow vests and gloves, some removed poison ivy vines from trees and tombstones with loppers. Others placed every old glass bottle, candy bar wrapper or piece of Styrofoam they saw into trash bags, keeping their heads pointed to the ground in focus. Covington and a few others collected fallen tree limbs and piled them away from the burial sites. Throughout the afternoon, the pile grew larger but the amount of sticks left to carry seemed to remain the same. This afternoon was the fourth cleanup that Tania Dautlick, executive director of Keep Durham Beautiful, has organized. The lack of machines is only part of what makes cleaning up Geer Cemetery so difficult. The main problem is that the land is not owned by anyone — not the city, not the county, no private individuals nor churches. And if any group, or the City, does claim ownership, they would be responsible for the massive amount of cleanup work the cemetery needs. According to information compiled by the Friends of Geer Cemetery, an activist group supporting the preservation of the cemetery, the site was used as a burial ground for African-Americans from 1877 to 1944. This makes it Durham’s oldest African-American cemetery, and one that acts as the final resting place for many prominent individuals in its history. Two iconic Durham institutions can trace their history to Geer Cemetery. Margaret Ruffin Faucette, the founder of White Rock Baptist Church, and Rev. Augustus Shepard, the father of the founder of North Carolina Central University, are both buried there. These stories, and many others like them, combine to form such a rich history that groups like Keep Durham Beautiful feel that preserving the cemetery is a must. Before the volunteers began their work that afternoon, Councilman Eddie Davis, of the Durham City Council, came by to speak to the volunteers about the history of Geer Cemetery. Davis said he has been particularly interested in the former slaves buried at Geer Cemetery, and his interest has led him to some interesting stories. Davis said after the outbreak of the Civil War, many former slaves living in the Confederate states joined a movement called the United States Colored Troops. Davis said there is a connection to slavery in each person buried at Geer Cemetery. Given that Geer Cemetery is not owned, Davis said many people have asked the City of Durham to claim the land. “There is certainly nothing that is standing in the way of the city that prevents them from doing that, except for the liability that would go along with it,” he said. This liability, Davis said, would involve the continued maintenance and upkeep of Geer Cemetery, thereby taking full responsibility for the work that is now being done by volunteers. Davis said he hopes Geer Cemetery is renovated one day, and the site becomes a place of remembrance and honor, much like Arlington National Cemetery. On Dec. 2-3, Davis and members of White Rock Baptist Church will be holding a wreath-laying ceremony at Geer Cemetery, as well as a program honoring the life of George Washington Pearson. 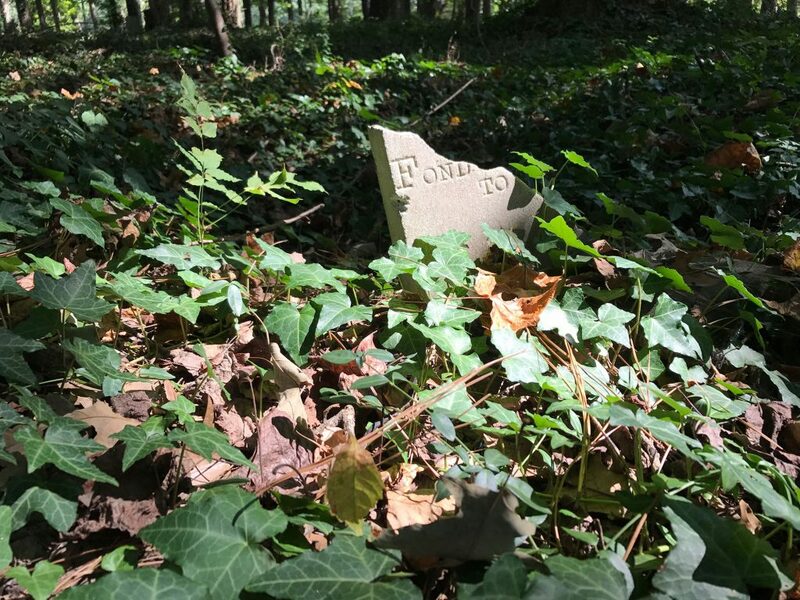 The work wasn’t easy, but Covington, a student at Durham Tech, was able to make the afternoon pass by talking with friends and making up little stories about the graves he saw — one of which involved Fannie Adora Beasley. 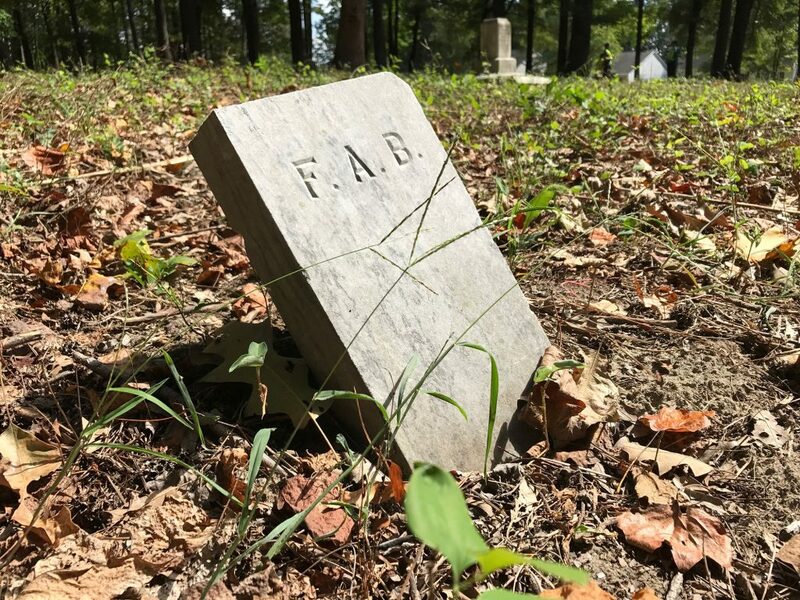 “What I love about her grave is that there’s a little marker with her initials on it that reads F-A-B, and I like to think that she was a pretty ‘fab’ person,” Covington said. The only information given on Beasley’s tombstone was that she was a mother and only reached 39 years of age. One of the other volunteers carrying sticks with Covington was Demario White, 26 and a junior at Durham Tech majoring in computer and information technology. He and Covington are friends and first heard about Geer Cemetery while at a Gamers of Durham school club meeting. “It’s kind of heartbreaking to see statues in the state that they are — broken and knocked down. It’d be a great project to restore this place to what it was,” White said. White has volunteered twice at the cemetery and said he really enjoys the progress he’s seen thus far. Davis McKinney is a senior reporting major at the UNC-CH School of Media and Journalism. A native of Spruce Pine, N.C., this fall he is serving as a writer-photographer for the VOICE.